Situated between the sea and countryside, Les Chambres d'hôtes Oze is just a 10-minute drive from the beaches in Brétignolles-sur-Mer. Saint-Gilles-Croix-de-Vie is 13 km away and the Brem-sur-Mer Marshes are a 10-minute drive from the property. Each room here will provide you with a terrace and there is also an electric kettle for making hot drinks. Featuring a shower, the private bathroom also comes with a hairdryer. You can enjoy garden views from the room. 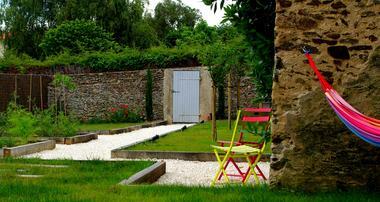 At Les Chambres d'hôtes Oze you will find a garden and the property offers free parking. Guests can go walking around the Jaunay Lake, 5 km away or in the Olonne-sur-Mer Forest, 16 km from the accommodation. The owner also offers tours around his sculpture workshop and activities such as surfing, kayaking and kite flying are possible in the area. Nantes Atlantique Airport is 59 km away. This property also has one of the best-rated locations in La Chaize-Giraud! Guests are happier about it compared to other properties in the area. There is no review about Les Chambres D'hotes Oze, be the first to leave one !